There’s a magnificent Arab Letterpress outside workshops on the Broadoak road, that marks where Creeds Printers did business for nearly sixty years, until it moved into the digital era and the new Bridport premises at Gore Cross. But Creeds Design and Print first started life a bit further west down that original country road at New House Farm, where John Creed took the passion he’d developed for printing at Bridport Grammar’s after-school club and turned it into an enterprise using petrol-driven machines in an old outhouse—there would be no electricity in the Marshwood Vale until the early 1960s. 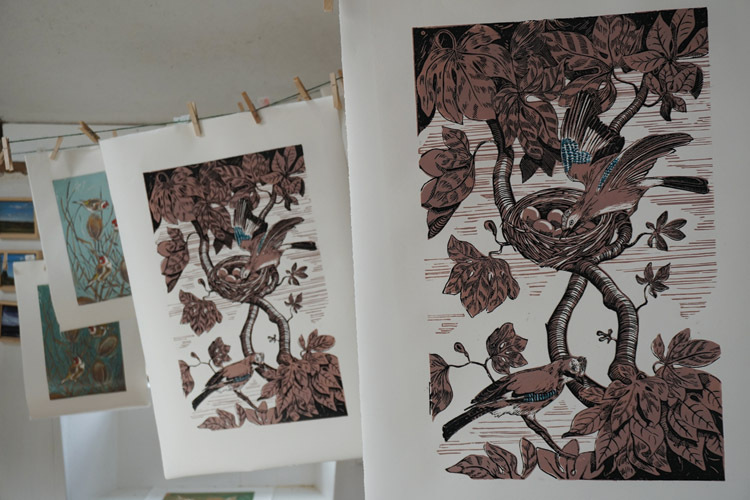 Now, artist Sophie Sharp—and her newly acquired Dutch Polymetaal Press—are bringing printing back to the farm in a converted studio in the old milk parlour, alongside the New House Pottery and Made In The Vale craft workshop. Sophie initially focussed on portraits and still life, but in the last decade she has added landscape to her painting work and developed printing skills to create cards, limited edition prints, cushion covers and lampshades. 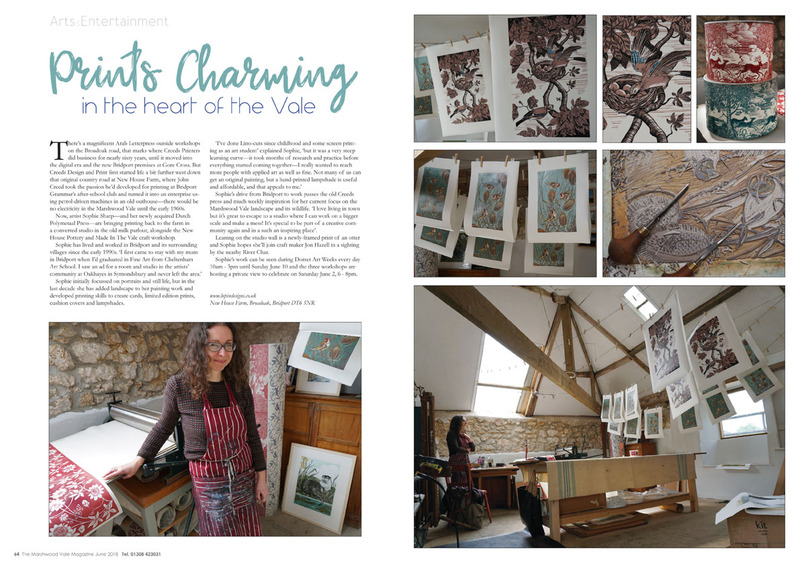 Sophie’s drive from Bridport to work passes the old Creeds press and much weekly inspiration for her current focus on the Marshwood Vale landscape and its wildlife. ‘I love living in town but it’s great to escape to a studio where I can work on a bigger scale and make a mess! It’s special to be part of a creative community again and in a such an inspiring place’. Leaning on the studio wall is a newly-framed print of an otter and Sophie hopes she’ll join craft maker Jon Hazell in a sighting by the nearby River Char. Sophie’s work can be seen during Dorset Art Weeks every day 10am – 3pm until Sunday June 10 and the three workshops are hosting a private view to celebrate on Saturday June 2, 6 – 8pm.